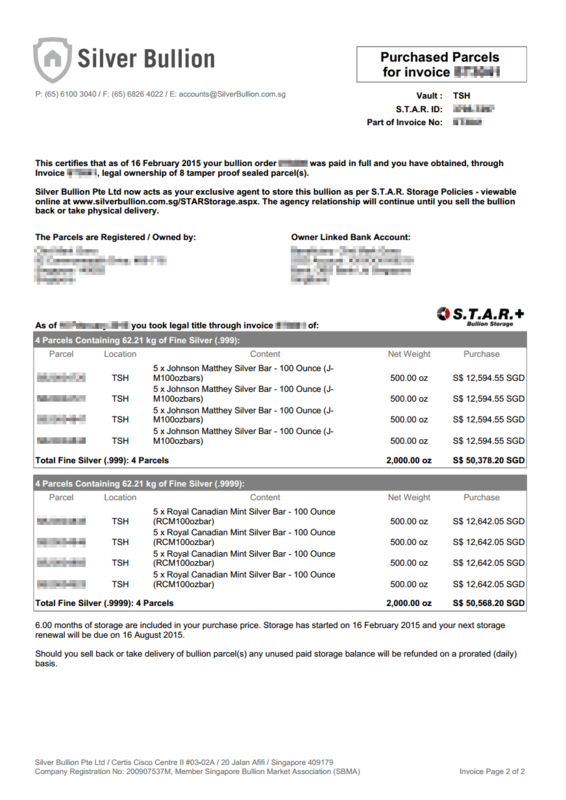 Bullion "parcelization" with photo and full liability protection under S.T.A.R. Storage. 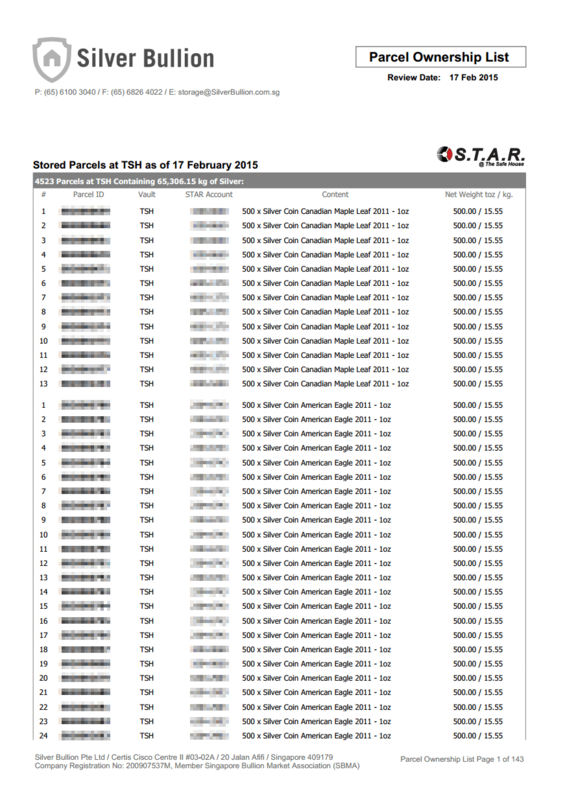 DUX tested and TPL marked to the Parcel so that results can be retrieved online. All S.T.A.R. 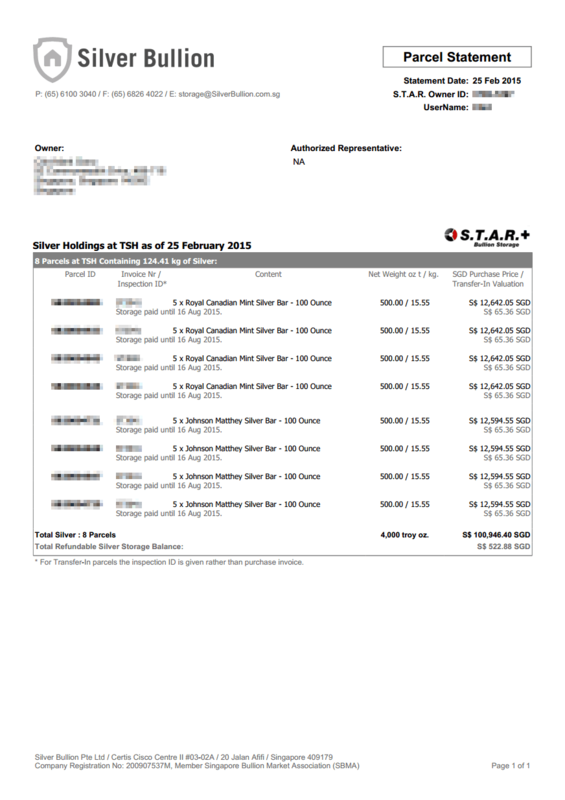 Storage parties, Silver Bullion Pte Ltd and The Safe House Pte Ltd, have no exposure or operations in the US. This makes S.T.A.R. Storage an ideal storage location in case of a repeat US Bullion Nationalization event. All parcels can be easily sold back online or requested for physical delivery. This service is unique as vaults can store your retail bullion but will not entertain buybacks as they store on a "said to contain basis" and cannot test the bullion. For a customer we feel that bullion storage without an easy buyback option makes remote storage impractical at best as there is no easy way to close a position once you need money. S.T.A.R. Storage and DUX make transfers with buyback possible. Must pass DUX Tests to enter into S.T.A.R. Storage. Singapore Customs takes a serious view of matters when it comes to misdeclaration of goods entering Singapore. We strongly advise you and your shipper to double check that the goods declared matches the contents of the parcels arriving at The Safe House. Misdeclarations require follow up reports and potential audits and investigations by the Singapore Customs. Should there be discrepancies between what arrives and what was declared, we reserve the right to levy an initial processing fee of SGD 500 (or greater) depending on how long it takes for the case to be resolved. To initiate a transfer-in, please create an account or sign in. It is your responsibility to ensure that your bullion reaches our office/depository in Singapore. Commercial Shippers: Companies such as UPS and FedEx will normally only insure shipments up to a nominal amount (e.g. 500 USD) and external additional insurance is normally not available to private individuals. We highly discourage you from shipping internationally without full insurance and correct customs declaration (using correct HS codes for IPM bullion) as you would have no recourse if a shipments is lost, especially if the bullion cannot pass international customs due to incorrect a paperwork and is sent back. Some shippers such as DHL will not ship bullion in the first place. Precious Metal Shippers: ViaMat or Brink's can handle these shipment requirements safely but such shipping is expensive and normally only makes sense if you are shipping substantial quantities (e.g. ten thousand ounces silver). Furthermore the process can be complicated, requiring separate shipments to a ViaMat/Brink's distribution center. In Person Delivery: Shipping just 20 oz of gold via a dedicated fully insured shipper internationally can easily cost as much as 1,200 USD. If you have the time and wish to transfer gold (as it is easily portable compared to silver) consider flying to Singapore and delivering the bullion yourself. This option would allow you to see our operations and get a feel of Singapore first-hand. If you are already in Singapore, this option is the obvious choice. Regardless of your shipping preference, you need to understand which bullion is IPM (Tax Free) in Singapore to avoid paying a 7% tax on import. Note that we have close relationships with Singapore Customs and have helped to train customs officers on implementing bullion taxability rules so our processes are fully compliant with Singapore Customs. Please note that the reality of international bullion shipments, is that unless it involved substantial volumes of IPM bullion, it might be cheaper and more effective to simply sell bullion in your home country and buy new bullion in Singapore. We can organize fully insured transport within Singapore for you. Accepting and verifying bullion shipments as genuine, as opposed to storing them on a "said to contain basis", is a unique process made possible by the combination of S.T.A.R. Storage and DUX Testing. 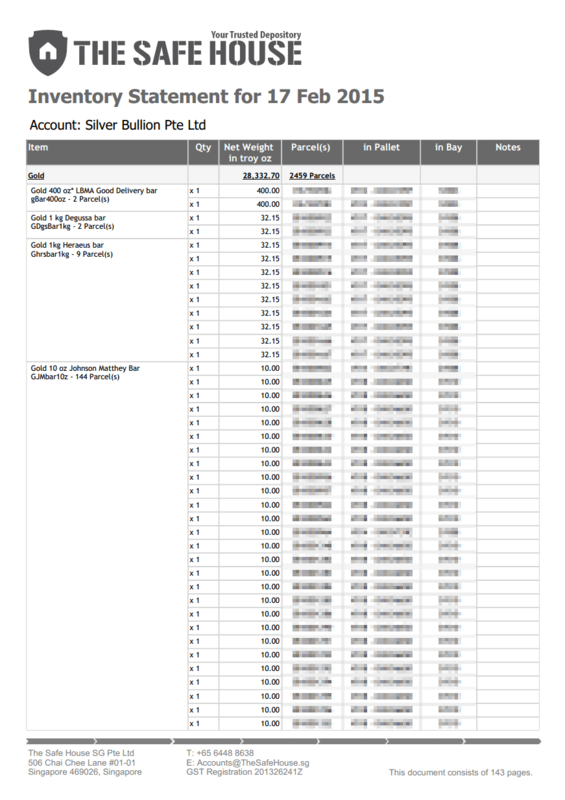 This process allows you to transfer bullion and, if requested, easily sell it to us. To our knowledge no other company in the industry is offering such a service because it exposes the receiving company (Silver Bullion) to a lot of potential liability risk that has to be mitigated or eliminated through very careful process planning. 24 CCTV cameras in our office / depository record how the package is received and signed for by SB personnel and the package is transferred into the safe room under CCTV. Silver Bullion staff unpack the bullion in the safe room test area - prominently displaying the package shipping ID or airway bill number - under high definition CCTV. Contained Bullion is counted to match the packing list and bullion is DUX Tested and TPL marked - under high definition CCTV. Please note that this involves opening coin containers (see unpacking notice). DUX-Passed Bullion is then packed according to prescribed multiples into tamper-proof bags [having S.T.A.R. Parcel number], sealed, photographed - all done under high definition CCTV - and kept in a safe for further transfer for long term storage in the vaults. The S.T.A.R. Parcels have thus been created and will be entered into inventory being at our SB Depository where they are covered by SB insurance. DUX-Failed Bullion is also packed into tamper proof bags [with unique parcel number] and sealed - under high definition CCTV. Customer will then be notified about the failed DUX Test and we will provide the CCTV video recording of the process and test results for maximum transparency. The tested bullion will be returned [pending available shipping solutions – to be paid by customer] to the customer. Transfer to long term S.T.A.R. vault occurs at regular intervals whereby the bullion will enter vault operator inventory [with full liability coverage]. You will then be able to view Parcel Photos, Parcel Ownership List, Vault Operator Inventory Statements by parcel and DUX Test results by parcel online. 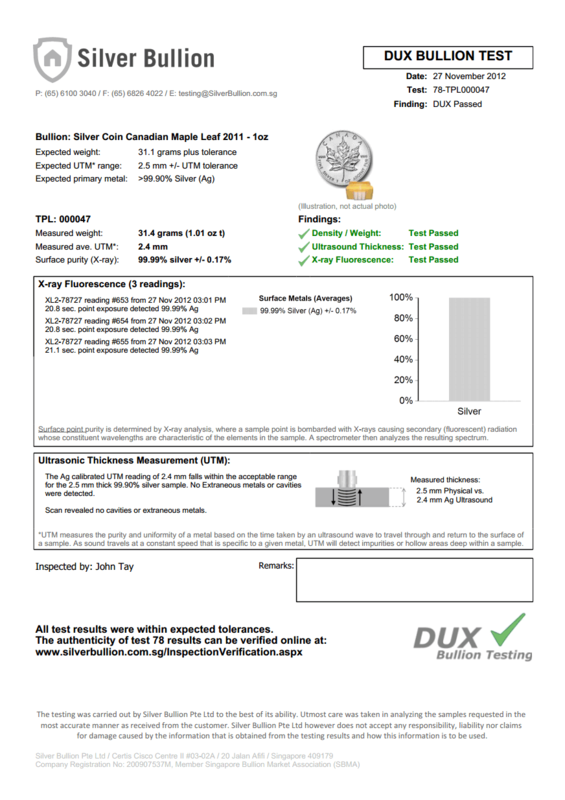 DUX results are uploaded automatically online and associated with the packed parcel so that the owner of the bullion can check DUX results online. Bullion coin monster boxes, with exception of sealed Mexican Libertad silver bullion coins which are originally packed with a secure seal, have to be opened for DUX testing. 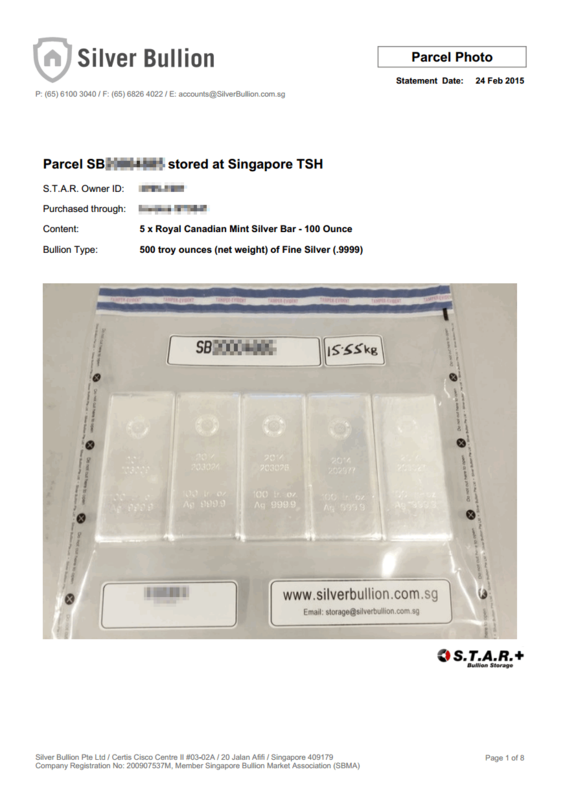 We test a minimum of five tubes which will each be sealed with an individual Tamper Proof Label [TPL] and the box itself will be "re-sealed" with a Silver Bullion Pte Ltd plastic strip similar to the ones used by most mints. Opening the box is a necessary precaution as a standard "sealed" 500 coin monster box only has a generic plastic strip that is not tamper proof nor tamper evident. Sealed bullion bars in plastic sleeves will be cut open and tested. If feasible the bar will then be placed back into the packaging and the cut section of the packaging will be sealed with a TPL. Otherwise the TPL will be placed directly on the bullion and the packaging discarded. 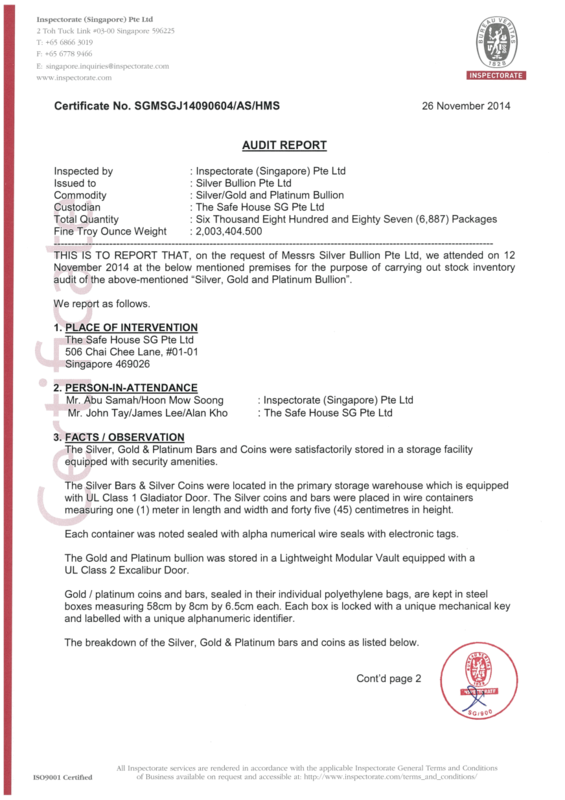 Note that all bullion items are further packed into the uniquely identified S.T.A.R. Storage Tamper Proof Bullion Bags.